Sometimes I did a reverse take on this. Loaded up on the veggies. Raised the milk glass to my mouth. And spit them into my glass of milk. Of course this deception only worked until dinner was done and Dad would rinse the dishes. He'd pour out the milk plus my serving of vegetables into the sink and I'd be caught. What often worked was loading myself up with my portion of vegetables and then excuse myself from the table with a mumbled "Ah haff ta gho ta uhn baffwoom" (I have to go to the bathroom) then make a beeline for the facility where I'd spit out all the offending legumes and quickly flush. Then I'd return to the table and my folks were none the wiser. Or so I thought. But Mom went to great lengths to ensure my brothers and I got our fair share of vitamins via vegetables. Like all good Catholic families, we didn't eat meat on Fridays. 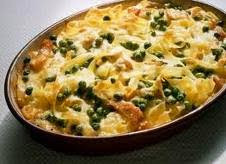 Mom often prepared a tuna casserole. In those days, a tuna casserole consisted of what one today would call Kraft Dinner, sprinkled with tuna and...wait for it...Mom's own special contribution...canned peas. That's right. Peas. Mixed into the casserole. There'd be no spitting them into my glass of milk. I'd have to eat them right along with the tuna and noodles. To this day I remember Mom's trick. And I've never eaten another pea! I guess you could say, unlike John Lennon, I never gave peas a chance. Great post! I hate peas too. Love the last line of your post! ha! I saw a bumper sticker once that said "whirled peas" it made me wanna gag! Kimber: Whirled peas. I love that. Wish I'd thought of it. We pea-pickin' pea haters should stick together. It's hard for me to relate. I have no 'beef' with vegetables. But there are some I like better than others thats for sure. I don't get cooked carrots at all. They are actually very good raw. Cooked they becomes a weird, soggy tasteless mess. Bleh. Simple Dude: My ex mother-in-law used to put brussel sprouts in mashed potatoes. She also made gravy with instant coffee. But that's another story. I love peas and am always surprised by folks who don't. Green beans? Sure. They're sort of tasteless. My wife talks about Kraft Dinner. I thought it was just something she said. It took me a while to figure out she meant Mac & Cheese (that "while" would have been just after I saw the box Kraft Dinner came in). 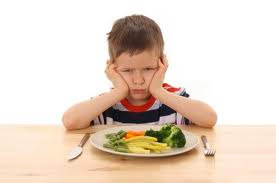 Cdn Blend: I'm convinced peas were invented by the devil to punish little boys. I must have been really bad as a kid. I know that casserole well. My dad loves it! it's comfort food for him. killer last line, snicker snicker. Ha! You so fonny Sir Nomesters! But I do agree with you: lima beans, waxed beans, and creamed corn. They are all of the devil. I only enjoy eating fresh peas from the garden. Anything else? The only good vegetables are fresh vegetables. I also grew up with canned, mushy vegetables made even worse by being boiled to death after they left the can. And I remember well the tuna casserole trick. My mom also made a lovely concoction of creamed tuna and peas on toast. Doesn't that sound appetizing? It wasn't until I was an adult and ate fresh vegetables that I found them tolerable. I grew up eating raw veggies from my granny's garden. I could eat a veggie lunch and have a fresh dessert from there too - bing cherries, pears and raspberries. But if you can pick them right of the vine, you really should give peas a chance! EG: We had it almost every Friday when I was a kid. On special occasions my mom left the peas out. Boom Boom: Creamed tuna and peas on toast? Oh God that's disgusting. Boy the moms of our generation certainly were inventive weren't they? I will give you this. As an adult I love snow peas. Don't tell anyone. Quirks: Almost no vegetables whatsoever? You're one step ahead of being a Zombie! For many years I have claimed to be an "animarian" when it comes to food -- that is, I eat only those things which, when alive, can move. My reasoning has always been that since all life is imbued with some form of consciousness, killing and eating anything is a form of murder. However, since it is also a fact that we must eat, then it is more ethical to eat only those things which have at least a theoretical chance of defending themselves -- which means animals. Of course, because I do actually enjoy potatoes I claim that they, and other tubers, are defending themselves by burrowing into the ground. My only regret is telling this to a very sweet vegetarian couple from Quebec who became distressed because, while they could clearly see the logic of my position, simply couldn't reconcile themselves to eating animals. I don't know what ever happened to them. For all I know, they starved to death. Luckily, both Alex and I love fresh vegetables. We have an incredible amount of organic fruit and veggies in our area. I love chard, spinach, fresh peas, fresh brussel sprouts, (I make them with bacon and chicken broth and everybody loves them at my house), green beans, it's all good. My mother did the canned peas that were cooked to mush too. And the tuna casserole every Friday. Ick. Frank: Interesting approach. How's it worked out for you? Eaten any polar bear, wild boar or giraffe lately? Linda Medrano: Ah, brussel sprouts. The veggie that just keeps on giving. I, too, came up with various ways to hide the fact that I would not eat my green vegetables. Spitting them into my napkin, pushing them under my plate, etc. And then I discovered that our cross-eyed Siamese cat would eat ANYTHING and he discovered that if he hung out under the table by me, he'd get some food on the sly. It was a win-win! Kelly: A vegetable eating cat? Boy, it's a good thing cats have 9 lives! I LOVED my mom's tuna casserole. Good stuff. But then, I'm also a fan of creamed corn and peas. I actually liked veggies as a kid. Liver on the other something I could not get past my nose. I once hid a piece of liver in the hutch drawer behind my seat. I would have gotten away with it if the cats hadn't busted me later that day by trying to get into the drawer. You can imagine my mother's surprise when she opened it to see what those damn cats were after. HJ: I'm with you on the liver. My Dad on the other hand loved his liver and onions with lima beans. Yuck. I don't know what was worse at our table - the veges or the milk. One time, and my mother will NEVER live this down, she tried to make hamburgers out of lentil beans - EEEW - but with six kids on a Navy guys salary she had to be inventive. I couldn't choke anything down with the milk I HAD to drink because the powdered milk concoction she came up with was vomit inducing on its own. Luckily I had three little brothers who ended up with a lot more crap on their plate - payback for babysitting services. Sheila:Okay, you win. Hamburgers out of lentil beans? Powdered milk? That beats any other story here I think. Poor you. You're the third person I know who hates peas. My wife being one of the others, and my brother-in-law the third. I myself love them. I also used to love tuna casserole, and I forgotten it even existed until I read this post. Now I'm craving some. With extra peas. Mike: I always thought you were a little off. Hey, did you know there were 1,921 green pea suppliers in the world? My God, it's a conspiracy. IWBY:Response? Oh yeah. Everyone wanted a little peas of the action I guess. Damn. 'Cause I don't check in here enough I missed this post. Can we start a War and Peas club? I think we'd have plenty of members! Deb: Because you don't check in here enough I just found your comments in my trash...which is a good place for peas by the way.